"From my mother, I remember vividly the heart-shaped double layer cakes she baked for our Valentine's Day celebrations. Rich, tasty, golden, butter cakes made from scratch with sweet pink, strawberry flavored frosting. I still have her vintage, old Duncan Hines cookbook with that cake recipe, but I haven't tried to replicate it yet. Maybe I will make it on Valentine's Day and revisit those wonderful, warm childhood memories of the people who affectionately launched my Valentine traditions." 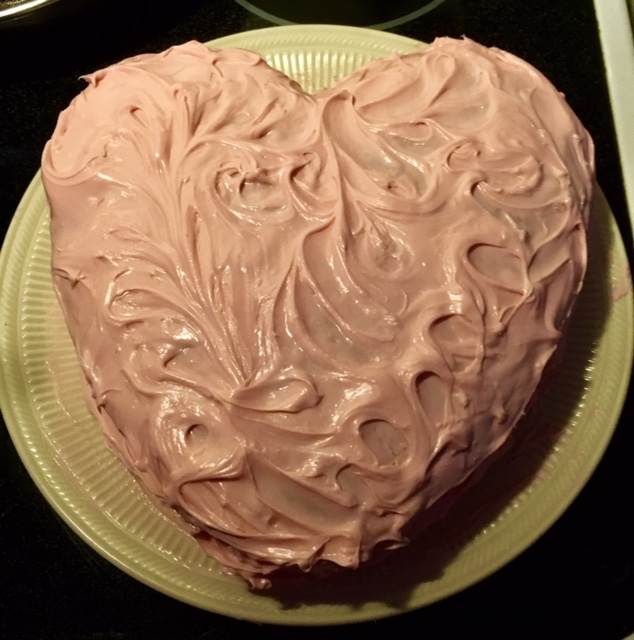 Although I haven't been inclined to make the cake in recent years, not being a particularly adept baker or that fond of sweets, I was prompted to make the heart-shaped golden butter Valentine cake today, with its tasty pink frosting colored and flavored with strawberry. I added my own variation this time, inserting a thin layer raspberry preserves to separate the cake's two layers. The strawberry frosting can be quite strong and I wanted to replace it in the middle of the cake and thought a slightly contrasting raspberry flavor - one of my favorites - would be just the thing. The cake itself is also rich with eggs and butter, so I thought the combination of flavors could stand a bit of tweaking from my mother's original. I still have my mother's well worn and dog-eared paperback copy of Adventures in Good Cooking and the Art of Carving - Famous Recipes - A Duncan Hines Book of recipes and tips for cooking and carving from people, restaurants and inns from around the country and Canada. It's a 1948 edition - the 18th printing and the year my parents were married - and a wonderful thing to have in my own library, placed among some of my mother's favorite cookbooks. Calling them favorites probably would be a bit of a stretch as she didn't have many cookbooks (while, by contrast, I have dozens and dozens!) and relied on certain recipes over the years of her lifetime as a wife and mother. Like so many wives and mothers in the mid-20th century, my mother was a self-taught cook. She didn't love cooking as I do, but she was a more precise and exacting one than I am. I am a bit more adventurous cook in some ways, as I had the opportunity to travel to Europe with my father (and brother) when I was just 12 and taste some fairly exotic dishes (while my mother got a welcome 3-week break from having us underfoot that August), but she made very well the meals and dishes that she did prepare. Her food was uncomplicated and honest and always tasty, so that's really all that mattered at that point. I appreciated her interest in making nutritious and attractive meals for us even though she regarded it as much of a chore as keeping house...it didn't show and it certainly didn't deny us the hearty and satisfying meals we enjoyed at home every day. I hope you have some special Valentine food traditions and special memories that go along with them.